It’s Twelfth Night tonight, January 6th, the traditional start of the Carnival season, and that means King Cake parties in Louisiana. Whoever gets the baby trinket in their piece of King Cake either hosts the next King Cake party, or chokes to death because their host didn’t warn them that it was within the cake, so please do so. I will update this post tomorrow with more on the historical meaning of the cake and so forth, but for now, lets just have some cake. Dissolve the yeast in the workbowl of a stand mixer fitted with the dough hook attachment, let stand until frothy. Dissolve the salt, sugar, orange zest and milk in a small bowl. When dissolved combine the milk mixture with the yeast mixture. Mix the cinnamon with the flour. Turn the dough into an oiled bowl, loosely cover with plastic wrap and let rise for 1 hour in a warm spot. When the dough has doubled in bulk punch it down, cover and place in the refrigerator overnight. My friend Jason of Off The Broiler also brought this Latin-American version of King Cake to my attention courtesy of Daisy Martinez. It’ s Marzipan filled and looks absolutely gorgeous. Are you a chef? Outstanding. Your king cake loook just beautifil. I came on to your site to get ideas of what to serve for Mardi Gras (here in Italy) along with my gumbo. I just hope my version of king cake will come out as nicely. This recipe is delicious! Would also be great for breakfast. You can buy FEVES on e-bay. Also check outthis website loaded with great info! Pingback: Yucatan Living - Roscas de Reyes, Colds and Senators! Do you know what it means to miss new orleans!! 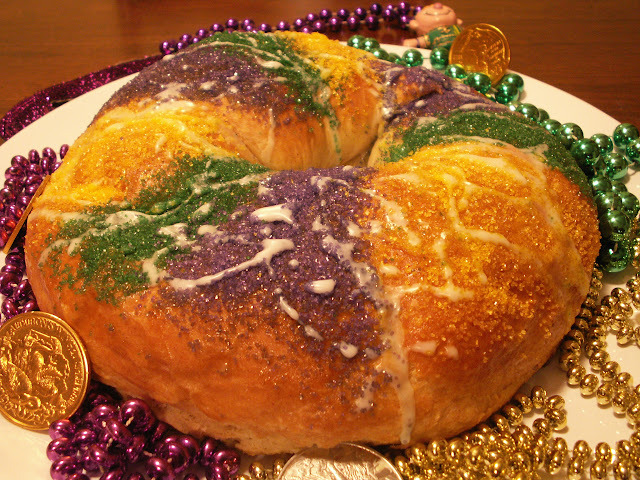 My king cake is on the table at home…waiting for Mardi Gras celebration this evening! This king cake looks so good. I wish I would have taken the time to make one for my Cajun husband this year. Instead I took the lazy way out and bought at Publix. Blah!… Lesson learned! I lived in NOLA 3 years befor K. I havn’t been back yet. I have been searching for this recipe and will now make one and drink a glass of wine. Thank you! Make it! Ate it! Drank the wine. Loved it. Oh the memories! The list of ingredients calls for an egg wash, but I don’t see when to apply it. Could the chef clarify? Thanks! Katie – Sorry for the typo, it is brushed on just before it goes into the oven. Quick question… Does the dough have to refrigerate over night? I have seen many versions of the king cake recipe, and this is the only one that asks for it. What will happen if I do not have time for the overnight resting? I’m new to Mardi Gras celebrations, but this year I’m having a dinner party and wanted to include this treat. It smells and looks great, I can’t wait to taste it on Tuesday! My only novice slip was that I rolled my dough too thin and it burst in a couple places, exposing the praline. I plan on making this again, even if it isn’t for Mardi Gras. Thanks for the recipe. For the person asking about a bakery to order a king cake (even though mardi gras is almost here and gone) – Ambrosia Bakery in Baton Rouge, La. I am sure there are other great places but I have been ordering from here ever since I moved away from Louisiana and I can’t say one bad thing about their cake or delivery. Hope this helps. This turned out to be a great recipe! I also used your shrimp ettouffe and red beans recipes for a party this weekend and both were hits. Thanks!!! Do you know where plastic feves can be purchased in the United States? I have been looking all over. Thanks so much. I’ve actually never placed the dough in the refrigerator to chill overnight — this seems a little unneccesary. If you can get your hands on a King Cake mix, Mamm Papaul’s makes a really good one that you can buy at most any supermarket in New Orleans during Carnival season (Mamou Anne’s Mix is also good). You don’t even need a mixer with a dough hook; did cakes for years just using the plastic bag to mix everything in. As for my favorite bakery to buy from, I still like McKenzie’s the best! Was so sad to see them close after Carnival in 2001. First, I must say that picture of your King Cake is absolutely beautiful. (Do you, by chance, bake & ship King Cakes that ACTUALLY LOOK like the one in the picture??? Actually full of cake & not empty space!?! )That was a joke. Now…at the risk of sounding stupid, I have a couple of questions. #1-What exactly is a “Brioche Dough”…& why is it called “Brioche”?? #2-“plastic or porcelain “Feves”??? What is a Feve? (All I can figure is it’s another name for the little baby in the cake.) & #3-on 17 Jan.,2010, Auggie had a very good question, but no one has answered it. I would also like to know…”Is it really necessary to cover & place the dough in the fridge overnight?? ?” And if so, what purpose does that serve??? (Does it make the dough rise to make the cake look like the beautiful picture up top?) Obviously, I’m no “chef”. I can cook…I make a mean homemade Jambalaya & a “to die for Gumbo”, but I have never in my 49 years baked a “homemade king cake”. Don’t know why…just always buy them. (So hard to just walk past them in the grocery store without picking one up.) And yes, someone said they’re good for breakfast…they got that right. So, as your very 1st comment asked…”ARE YOU A CHEF?? ?” Guess I could click on your name at top of page & get the answer to that. Thanks for the recipe, Danno. Looks so good. My mouth is watering. OH YEA…HOW ‘BOUT THEM SAINTS ! ! ! Just 2 days till the BIG DAY! ! ! I believe with all of my heart & soul that the SAINTS can & will win this SUPERBOWL! We’ve come way too far to not just go ahead & win this last game of the season…(I say this so casually, yet I’m really very nervous, anxious, EXCITED, or whatever the word is to describe what I’m feeling.) I’ve been a SAINTS fan for so many years. I remember the first time we actually had a “winning season” & all of the “brown bags” people wore on their heads. That really ticked me off, but guess-to each his own… Anyway, thanks for the recipe. Sounds like it’ll make a great King Cake. Jackie D.
I just wanted to know how many people will this cake serve? Thanks! I live in New Orleans, and I’m sure just about anyone down here yall ask, they’ll tell you the best king cakes are at manny randazzo’s 😀 Well it’s fat tuesday today, thanks for the great recipe, now I’m off to go see Zulu and Rex!! Let the good times roll ya’ll!!! This sounds sooo good. I plan to try it soon. Where do you buy the colored sugars or do you make it instead? So many have asked in resting the brioche dough over night is necessary, I have been making brioche for close to seven years, while I do not think it is mandatory, it makes a much better dough and much much easier to handle, it is very soft and rich. I have not made a king cake though. The resting of the dough makes the dough create more gluten, but very slowly so that you also do not toughen up the dough at the same time. In fact many brioche recipes have you create a sponge for about 4 to 10 hours before you even begin the dough proper. The longer you let the dough ferment the better the taste. By placing it in the refrigerator, it does not grow too fast, or over ferment and go sour plus you have butter and eggs, and they can go off quickly if not properly stored. And I would assume that in NOLA the humidity and heat would not be so good for dough and sponge left out for 10 plus hours unless it is a dairy-less dough. I love, truly love this site. I grew up eating a very spicy(Texan) variation of gumbo, fired catfish, greens and much other soul, creole and other sought tasties. This is by far the best content of the subject I have found and I making the muffuletta to take with us to the ball game this week. Cannot wait. I love this site, but sadly this recipe was a total loss for me– I had to add about a cup more of flour, and though my yeast frothed, the dough never rose, so I threw it out… I’ll try again on a day in which fewer things have gone wrong (bad days often translate to bad bread) but… the thing that occurs to me is that I’ve never proofed yeast without sugar before? I’m sure that this is just me. Something is wrong with this recipe. I’ve made breads and various pastries before, so I feel like I basically know what I’m doing. Once you’ve added the flour, the dough is so dry and tough that it’s almost impossible to knead, and you can forget about the butter staying solid while you work it in–the dough is just too tough.